Christmas is just around the corner and for those with young children this may well entail – as well as wrapping late and waking early – obligatory attendance at the traditional school plays that re-enact a particularly famous birth. The Nativity may be unique, but whether for celebration, ritual or act of witness, the account of a birth has a real potency, and rarely more so than in the context of dynastic royalty. This entry was posted in Letters in Focus, Project Updates, Websites, Databases, Apps, & Code on December 23, 2013 by Miranda Lewis. 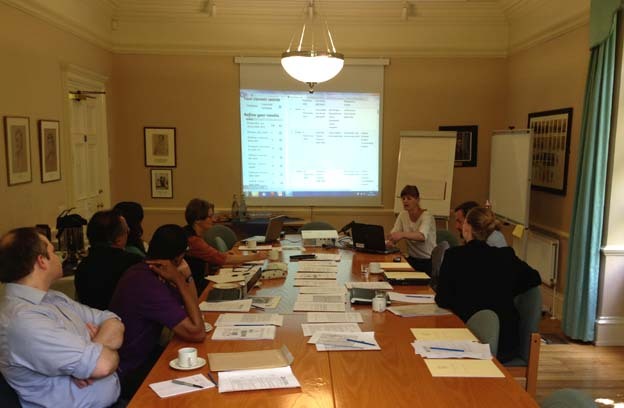 Podcasts, slides, and brief write-ups from our recent workshop on Digital Prosopographies: Case Studies in Online Collective Biography (Monday 29 July, St Anne’s College, University of Oxford) are now available in our Resources section. Predicated on the idea that the insights and methodologies of prosopography – or, the ‘investigation of the… characteristics of a historical group’ – underpins much social network analysis, the event brought together eight European projects to explore case studies, standards, and best practices relating to the electronic capture and representation of people, biographies, social and professional relationships, and their underlying sources. 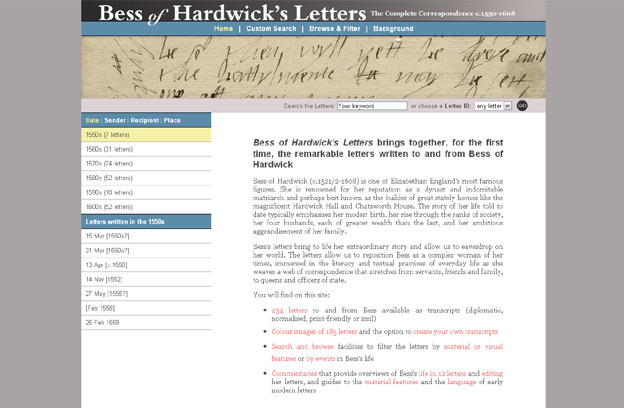 Findings will feed into the development of a more sophisticated prosopographical toolset within Early Modern Letters Online and the development of a series of prosopographical visualizations, focusing in the first instance on the epistolary communities around Samuel Hartlib and Jan Amos Comenius, in 2014. This entry was posted in Events, Podcasts & Videos, Project Updates, Websites, Databases, Apps, & Code on August 12, 2013 by James Brown. Sixty years on from the coronation of Elizabeth II could be a moment to consider the coronation of another British queen for whom this time-honoured ceremony ran neither seamlessly nor to plan. Not only did the bishops apparently forget the communion bread and wine but it seems the crown was put on askew by the Archbishop of Canterbury and the Queen herself was obliged to readjust it. Subsequently, as the Scottish Episcopal bishop Archibald Campbell relates in his letter to the non-juroring bishop Thomas Brett, the crown fell off entirely. This entry was posted in Letters in Focus, Websites, Databases, Apps, & Code on June 6, 2013 by Miranda Lewis. To all who are far from these wet and windswept coastal lands of western Europe, we extend an apology for the choice of this record from Early Modern Letters Online and would point out the great good fortune of those of you for whom spring has sprung and who do not long for this rain and unseasonable chill to end. For all those whose thoughts of shorts and sandals are – for the present – thwarted, we’d like to offer reassurance that the May we have experienced this year is not unique. 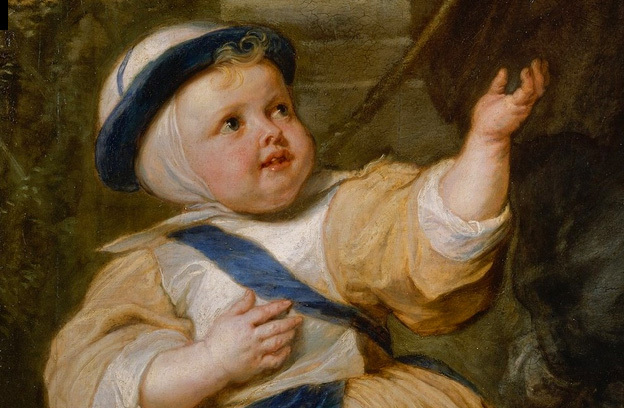 In May 1684, a twenty-three year old William Digby was travelling with his tutor through France. He wrote from Blois to Thomas Smith (Smith was, at this point, vice-president of Magdalen College, Oxford, Digby’s alma mater) that he had nothing to report but the unseasonable inclemency of the weather – it was, indeed, a January in May – and it had become so cold that he and his travelling companions had been forced to don winter clothes. Plus ça change. This entry was posted in Letters in Focus, Websites, Databases, Apps, & Code on May 29, 2013 by Miranda Lewis. 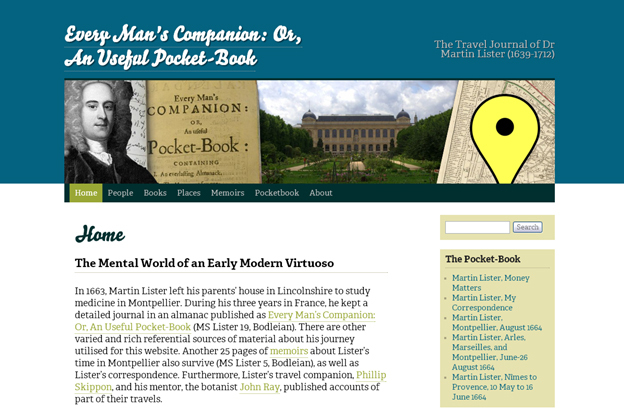 Our former Martin Lister Research Fellow Anna Marie Roos has recently launched a small but perfectly formed spin-off site Every Man’s Companion, or An Useful Pocket-Book: The Travel Journal of Dr Martin Lister (1639-1712). Funded by a British Academy small grant, the site brings to life the notes kept in an almanac by Lister during a medical peregrination to Montpellier in 1663, and includes the text of the journal (rendered as a blog); supporting material from Lister’s memoirs and correspondence; a cross-referenced index of people, places, and books; and some sumptuous photographs taken by Anna Marie when she retraced Lister’s steps in the summer of 2011. 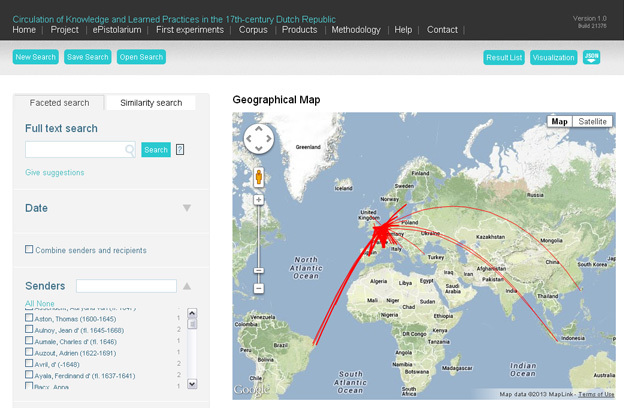 Anna Marie discusses the project in this paper delivered at our 2011 conference Intellectual Geography: Comparative Studies, 1500-1750. This entry was posted in Project Updates, Publications, Websites, Databases, Apps, & Code on April 26, 2013 by James Brown.